M3rNi3: Yorshire Pudding - Gracias sis! My sis went to London for a 3 week holiday and came back two days ago, Tuesday afternoon. As usual, I love to receive "pasalubung" - dats souvenir in Tagalog .. hehe .. This "angkapal mukha kho" aka "muka tak tahu malu" actually called her up and asked her to get me Instant Yorkshire Pudding for souvenir. Actually I saw a cook show and they were cooking something English, ie. Yorkshire Pudding with roasts and good ole sauce to go along .. slurp! As any good lil sis would, she bought me 2 packs. Thank you lil sis! 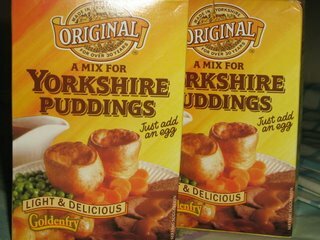 Will invite you over when I make Roast and Yorkshire Pudding yah! Wow your blog have been left stagnant for quite a while. Anyway its good that you are back kinda miss all the great recipes! Oh ya for yr info you have been tagged look over my post and you will understand what I meant. Anyway enjoy doing those tags *winks*!! !